I’m presenting at the Toronto SAS Meetup on 27Feb2019 05Mar2019, but I won’t be there, because, technology permitting, I’ll be presenting remotely from my nice warm office in the UK. This is intended to take advantage of remote communications and to avoid the need for me to fly over the Atlantic for a 20-minute talk! 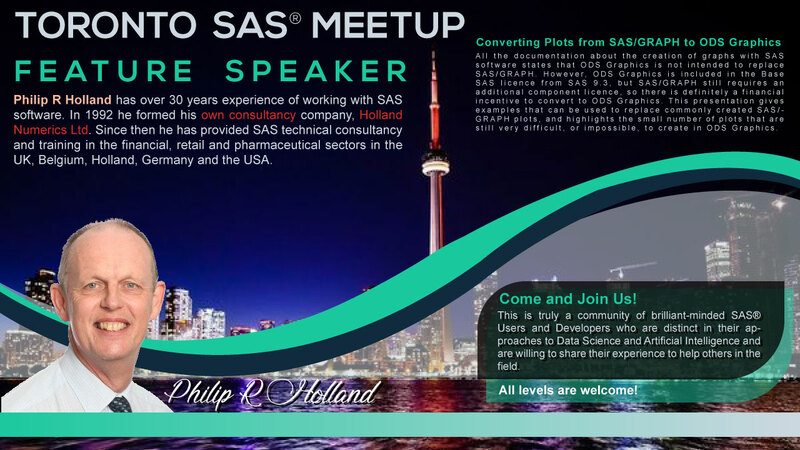 More information, including registration details, can be found at the Toronto SAS Meetup site. I’ll be presenting “Converting Plots from SAS/GRAPH to ODS Graphics”. Please come to the meeting and ask me questions, as I’ll be happy to discuss any of the points in my presentation with you. If you enjoy this presentation, then talk to Mamadou Dakouo about inviting me to present again at a future meeting, as this is the first of 4 different presentations about ODS Graphics. 3 comments on I’m presenting at the Toronto SAS Meetup on 05Mar2019, but I won’t be there! Unfortunately a last minute postponement due to snow storms in Toronto. The new date and time will be 05Mar2019 at 11:30am EDT (16:30pm GMT). You can watch the video of my presentation at the Toronto SAS meetup here.